Kundalini Reiki is described in detail below. You can opt to get attuned without having received the three sessions first, see what feels right to you. Student testimonials are below but each person will experience the attunements differently. Kundalini Reiki has been channelled by Ole Gabrielsen through Master Kuthumi who is the protector of the second ray also know as Koot Hoomi and K.H. Possibly the simplest healing and self-development system that exists! By opening/strengthening the energy channels of the body, it is possible to channel healing Reiki energy to yourself and others, just by intention. Reiki means “Universal life energy”. You can have access to Reiki via “attunement”. 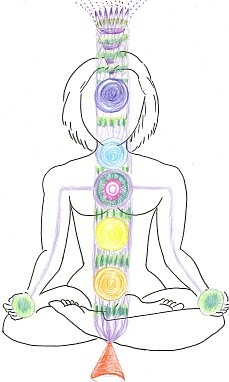 During attunement, different energy centres (Chakras) and energy channels are opened/strengthened. This way you can have access to this energy and channel it through your hands. You can then “switch on” the energy, just by intention. Reiki can also be used on animals, plants, water etc. Furthermore, it is possible to accelerate your personal development process drastically by opening the Kundalini. Basically, Kundalini means that certain healing channels and chakras have been opened, and you have thereby gained access to the Earth’s energy. The Root chakra, which is the energy centre located near the coccyx, acts as an entrance for the Kundalini energy. The Kundalini energy is also referred to as ”the Kundalini Fire”. Hereafter, the energy runs all the way up through the body, through the “main energy channel”, and out of the Crown chakra. Kundalini Reiki 1-2-3 are taken as remote, long-distance courses. There is no difference in the quality of attunements whether done “hands-on” or as a remote, long-distance attunement. If you have received at least Kundalini Reiki I and II from previous versionI, you can upgrate for £70 to get to the Master level, level III. So you will receive all three levels. The first attunement opens the healing channels to allow channelling of Reiki energy. At the same time you are prepared for the Kundalini awakening in Kundalini Reiki 2. The Crown, Heart and hand chakras are opened/strengthened. You are taught to perform a complete healing treatment and to heal remotely from a distance. In the Kundalini Reiki I attunement procedure, all of the knots/blocks in the chakras are removed (except for the root chakra). The main energy channel, from the crown chakra to the root chakra, is cleansed and prepared for the Kundalini awakening that you will experience in Kundalini Reiki 2. The Heart chakra becomes enlarged and the energy channel from the hands to the Crown chakra is opened so that the Reiki energy can flow. Once the Kundalini is activated in Kundalni Reiki 2, all of the main/primary chakras and the energy channels will be cleansed and opened. The Reiki channels are strengthened. The Kundalini awakening, where the main energy channel opens gently and surely, alighting the Kundalini “fire”, reaches the minimum Solar Plexus chakra, preparing for the full Kundalini rising in Kundalini Reiki 3. You are also taught a specific meditation. When you perform this meditation, you increase for a short time, the power of the flame in the Kundalini fire/energy. In this way, all the chakras/energy systems are enlightened and a cleansing takes place. From now on, when you are healing you have the choice of thinking either "Reiki" or Kundalini Reiki". When you use "Kundalini Reiki" you are activating your "Kundalini fire" as the healing energy, mixed with Reiki. Now you can use a specific meditation that helps the cleansing process of your energy system. The meditation takes about 5 minutes. I will enhance and strengthen your Kundalini energy. 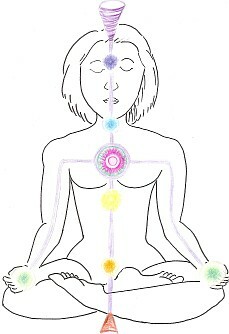 By doing this, all of the chakras and the energy channels light up and this helps the cleansing process of your chakras. “I have been floating around in the clouds since. At the time it felt like you were there actually flapping or waving your hand in front of my face. I had my eyes closed and was lying on the floor. I had the distinct impression that someone was walking towards me - like the light was changing. 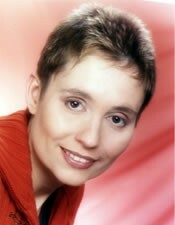 I got my first Kundandalini attunement last week from Sandra and the experience was lovely and enchanting. This is how I see Reiki. The Reiki energy is wonderful, Kundalini Reiki enhances it. I had 3 attunements in my life (Reiki I , and Reiki II two times). My exerpeince with Kundalini Reiki is better than any other attunements I had. I find it difficult to express about Kundalini Reiki. For me Kundalini Reiki makes your energy stronger and the feeling you get from the attunement is most amazing. It is soft, lovely, wonderful, powerful at the same time. I am now prepared to do Kundalini Reiki II & III and cannot wait for Sandra to come back from her Christmas break to carry on. Thank you Sandra for bringing thsi into my life." Francoise. "Hi Sandra, Thanks for the Kundalini attunement last night. I called it up at 9.30, and at first nothing much happened, then started to get some purple / red light (made me think of beetroot) and then felt some energy moving up through my body - feet upwards. Felt heat / movement in my arms, got some green light. Energy climaxed up my spine and up through the crown. Was getting a lot of powerful white / silver light and felt that had a sort of rope holding me upright and pulling upwards. “Thank you again Sandra. The attunement felt as though I was treating the body to something it very much wanted. This is how the attunement felt: I lay down flat on the bed just before 6 pm as arranged and soon after an expanding energy was felt in the throat and head area. For about half an hour I lay still and observed how the energy was pulsating in this area - working away where needed. Later now when I’m up and about, I can still feel the energy working away in the upper body, mainly in the head and throat. I am glad to know that any blockages that are there will dissolve. I shall certainly be practising the 5 minute Kundalini meditation every morning until the final attunement, its good to know we are helping our bodies to become healthy and free from the inside out. "Just before the attunement was about to start, both my hands started to tingle, then I felt the energy go up my legs. There was a bit of pain in my right thigh but then the energy moved up to my stomach, which is an area where I needed the most clearing. I felt a sharp pain on the right side then it went and the energy continued to move up my body. This lasted for about 10 mins, then I just felt blissed out! I stayed like that for about an hour. Once I had come out of the relaxation I was absolutely starving, which I think had something to do with the stomach clearing! I did the Kundalini meditation later on before bed and it was lovely. The bit I enjoyed most was it was so easy to meditate and my mind was blank as I normally find this quite hard to do. My hands got really hot and when the energy finished they cooled down so I knew it was time to stop. I feel much clearer and lighter after the attunement and it's only Monday (having received the attunement on Sunday) although I am quite tired. Thank you for a wonderful attunement." "The meditation is going well and it is fast becoming part of my routine. There has been a lot of positive energy surrounding me and things seem to be working themselves out. Lots of stuck problems now seem to have had energy blown into them and they are being resolved which is fabulous." "Thanks for the level 2 attunement the other day. This mainly seemed to work around the middle of the body, the arms and spine. Had orange and green (green leaves) colours. Was quite intense once it had started, although not as climatic as the first level. Lasted for eleven minutes. Have been doing the meditation every day since. 1st day felt energy at base, sacral and to spine. day 2 - red colour splashes and around heart. "I found it really difficult to concentrate yesterday, things kept popping in my mind and I kept clearing them out. It was like my eyes were opening and moving around even though my eyes were shut. I did the attunement and then all of the types of reiki the minimum amount of times so in total the whole thing took about 2.5 - 3 hours. I'll let you know of any other changes." "Before picking up the healing, did about half an hour of meditation. When I picked up, the attunement came in more or less right away. Felt a great weight in my hands, like I was holding a brick of energy. "Thank you so much again. its very peculiar as I fell asleep which is not like me at all.I will wait in the next few days and see.)"